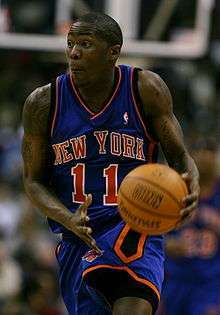 Jamal Crawford is the NBA leader in career four-point plays. In basketball, a four-point play is the rare occasion when an offensive player shoots and makes a three-point field goal while simultaneously being fouled by a defensive player, resulting in a shooting foul and one free throw attempt, or a two-point field goal and is intentionally or flagrantly fouled on the shot and is awarded two free throws. If the player makes his/her free throws, they will have scored four points on a single possession. The short-lived American Basketball League first introduced the four-point play to the game of basketball, and it was later adopted by the American Basketball Association during its inaugural season. The National Basketball Association (NBA) introduced that rule in 1979; FIBA in 1984; the NCAA in 1986 (men only) and 1987 (women); middle and high schools in 1987; and the WNBA in 1997. Sam Smith of the Chicago Bulls completed the first four-point play in NBA history on October 21, 1979, in a game against the Milwaukee Bucks. Dale Ellis was the first player in NBA history to complete two four-point plays in the same game when he did so in a win against the Sacramento Kings on January 26, 1988. As of November 18, 2016, Jamal Crawford is the league's career leader in regular-season four-point plays with 49, and 54 when including postseason play. ↑ "Four-point play – (Basketball): Definition". MiMi.hu. Retrieved January 10, 2009. ↑ "4-Point Play Gets Approval By ABA". Associated Press. July 11, 1967. Retrieved June 17, 2013. ↑ Sam Smith. "Taxing dilemma for NBA's 2010 free agents". bulls.com. July 27, 2009. Retrieved on October 11, 2009. ↑ "Ellis sets record with two four-point plays". Moscow-Pullman Daily News. Associated Press. January 27, 1988. Retrieved June 26, 2016. ↑ Astramskas, David (February 21, 2016). "JAMAL CRAWFORD CONTINUES TO ADD TO HIS UNTOUCHABLE NBA RECORD FOR 4-POINT PLAYS". ballislife.com. Retrieved February 27, 2016. ↑ "Clippers rip Nets 127-95 for 7th straight win, go to 10-1". ESPN.com. November 14, 2016. Retrieved November 15, 2016. G Jamal Crawford, the king of four-point plays , had one in the fourth, making a free throw after getting fouled on a 3-pointer he launched from in front of his team's bench.